The following summary was written by Graeme Woods. Thanks yet again for volunteering! This is the last Tom Swift Jr. summary of the lot: with this summary, the Complete Tom Swift is now complete! Summary: This book commences with Tom Swift Jr. working with the Navy to recover a Jupiter probe missile designed and built by Swift Enterprises on behalf of the government. However the Brungarians intercept the probe and Tom must race against time to recover it from the bottom of the ocean before the Brungarians can steal the probe and its scientific data. As the story unfolds, Tom invents several underwater devices to assist with the recovery and counter the threat of a new stealth submarine developed by the Brungarians. 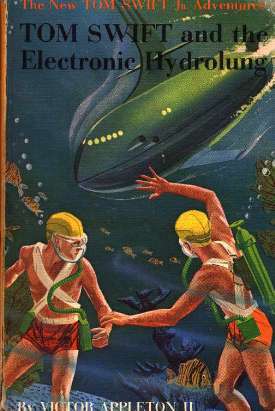 This book introduces a number of inventions that fall into two categories; devices that assist skin divers to recover the Jupiter probe (electronic hydrolung, hydrolung density control device, hydrolung ion drive) and devices that counter the threat of the new Brungarian stealth submarine (anti-detection jetmarine, quality analyser sonar). "Whatís needed is a new type of breathing device ñ one that will eliminate bulky air tanks and permit a skin diver to stay down for long periods." The hydrolung is a small device that extracts dissolved oxygen from water to allow skin divers to breathe underwater. Going over to a blackboard, Tom sketched out his idea. "Weíll pump in sea water and extract its dissolved oxygen by osmosis through a membrane ñ like this. Then weíll dry the oxygen in a dehumidifier and pump it into the dome through a heating and decompression unit. The stale air is then drawn out by a compressor, and the waste carbon dioxide is given off to the same sea water in exchange for the oxygen we removed. Of course there would be a constant circulation of both sea water and air. "How does it work?" Phyl asked, fascinated. Tom explained, "Actually its function is to replace the carbon dioxide that I exhale with fresh oxygen drawn from the water. Otherwise, although the carbon dioxide Iíd breathe out would be a very small amount at a time, it soon would make the air unfit. The nitrogen, which makes up much of the air we breathe, is chemically inert and can be used again and again." He pointed to a round screen on one side of the unit. "This is the water intake," Tom went on, "and this other screen is where the water comes out after weíve removed its oxygen." Near the forward end of the unit, a semirigid plastic tube was connected, leading up to the face mask. At the rear was a power port for inserting a small solar battery. "What about this little tuning knob?" Sandy asked. "Thatís the rate control for adjusting the output frequency to the wearerís breathing rate." Tom added, "Iíve decided to call the whole apparatus an ëelectronic hydrolung.í"
"Iíll install a special device to remove the nitrogen as the wearer exhales," Tom explained. "Then a valve will feed in helium to replace it. Since helium doesnít dissolve in the blood like nitrogen does, it will not bubble out when the pressure is reduced. Should have thought of that before!" "But youíll need a tank for the helium, wonít you?" Bud objected. Tom shook his head. "Enough can be compressed into a small capsule to supply the wearerís needs. Remember, it can be used over and over again." Would the electronic hydrolung work? The principle of the electronic hydrolung is sound; fish obtain their oxygen from water using their gills. Their gills perform the role of Tomís osmotic membrane. Scientists tried a device that is similar to the hydrolung in 1970. However no one has yet devised a practical hydrolung although new materials are allowing us to get closer to this. One problem is extracting enough oxygen from water for a person to breathe. Since Tomís hydrolung has a solar battery powering it, this could be used to pump water through the hydrolung which would make the idea practical since the osmotic membrane would not need to be so efficient. The solar battery is a sort of super capacitor that is charged in Tomís space outpost by solar radiation. Although scientists are now working on super capacitors that can store far more energy than todayís batteries, we donít currently have anything with the power density of a solar battery. The osmotic membrane must perform several roles; it needs to take oxygen from the water, dissolve exhaled carbon dioxide into the water and remove exhaled nitrogen and retain exhaled helium. I believe that an electronic hydrolung will ultimately be possible. A simple osmotic membrane may not provide the performance needed and I believe that it will comprise a combination of special materials with high surface areas and affinities to particular gasses. What impact would the electronic hydrolung have on our lives? A hydrolung would open up skin diving because bulky and inconvenient air bottles would no longer be needed. Also a diver would not need to come up for air since the hydrolung could simply extract oxygen from the water as required. This means that man could live beneath the sea for extended periods. This would open up underwater farming. Since the hydrolung replaces nitrogen dissolved in the blood with helium (which does not dissolve in the blood), the risk of the bends (as a result of pressure changes causing the nitrogen to come out of solution into cells as bubbles) is eliminated. The density control unit allows a diver to ascend and descend by varying his underwater density. "Itís a density-control device," Tom explained. "A substitute for ballast tanks, you might say. Itíll enable us to rise or sink to any depth at will, simply by varying our underwater density." Tom said the device would be carried in a small case, hooked to the diverís belt, with a single tuning-knob control. The "throttle" or speed control for the ion drive would be housed in the same unit. As you can see, the description doesnít give any indication of how this device works. Would the density control device work? I believe that it is improbable that a device that can be carried in a small diverís belt mounted case could change the density of a diver, unless it uses some previously unknown effect. Fish have swim bladders that can be filled with oxygen and nitrogen from the blood to adjust buoyancy to whatever depth the fish is swimming at so that the fish can maintain its level without effort. Submarines use ballast tanks to achieve the same result. In both cases, the size of the bladder or tank is relatively large in proportion to the size of the fish or submarine. Some exploration submarines such as the Bathyscape carry weights to be released when they need to ascend. A scuba diver wears a weight belt to achieve neutral buoyancy which allows the diver to swim up or down easily. What impact would the density control device have on our lives? A working density control device would have its biggest impact in submarine technology. There would no longer be a need for bulky ballast tanks. Also scuba divers would no longer need heavy weight belts to overcome excess buoyancy. The ion drive is a small but powerful underwater jet that is mounted on a diverís back to provide underwater propulsion. "a slender metal cylinder, two feet long, with an inner concentric tube projecting at each end." "But weíll need speed to cover the area. So first I want to add an ion drive to our equipment." "Ion drive? For underwater?" Bud, who was familiar with ion propulsion for spaceships, wrinkled his brow in a puzzled frown. "A goofy idea just occurred to me, but I think it may work out," Tom replied. He seized a pencil and began explaining what he had in mind. The drive unit would take water into itself, separate the ionized molecules, and expose them to an electric field. Thus a stream of water would be forced out. This procedure, in turn, would set up a siphoning action through a central tube ñ in effect, creating a small but powerful water-jet motor. So it is effectively a pump with no moving parts that uses an electric field to repel the charged ions present in water. The ion drive unit in the story is so powerful that the water jet pins Tom against the wall of the test tank. Would the underwater ion drive work? In principle, this could work. Even pure water contains ions that moved under the influence of an electric current. This could theoretically be translated into motion. Electrophoresis uses this effect to separate out different substances from solution for analysis; the substance is soaked into filter paper and a positive current is applied to one side of the paper and a negative current is applied to the other side. The various substances migrate towards the opposite polarity. Ion drives are being developed for spacecraft. Ion drives provide very low thrust but can be operated for long durations (in contrast a chemical rocket achieves speed through high acceleration over a short time period). However in practice I donít think the underwater ion drive would work because the energy input relative to the motive force produced would make a conventional propeller arrangement far more practical. What impact would the underwater ion drive have on our lives? If the underwater ion drive worked, I would see its biggest application in marine propulsion systems. Instead of complex and relatively inefficient propeller systems, the ion drive would directly convert electrical energy into motion without any moving parts. Submarines could use a similar system to avoid detection of propeller noise. As I recall, in "The Hunt for Red October", the Russian submarine uses a "worm drive" which apparently works in a similar way. The anti-detection equipment fitted to a jetmarine prevents detection of the vessel either by hydrophone or sonar. The idea certainly sounded feasible. Suppose the submarine used a great many "microphones" ñ or receiving transducers ñ to pick up the sonar pulses beamed out by another craft trying to detect it? These impulses could then be passed on and sent out by speakers on the opposite side of the sub, and relayed along on their underwater path of travel. Thus the sonar waves would appear to be striking no obstacle ñ and no echo would return to the sonarscopes on the search craft! Initially Tom wires up a jetmarine with hundreds of mikes and speakers all over the hull for testing. Later he develops a plastic coating (made of Tomasite) that incorporates the transmitting and receiving transducers spaced closely together, with the leads combined into a single flat tape going to the central control unit. "Well, we can never do away with the noise of a subís propulsion machinery," Tom began. "That goes without saying. So weíll have to camouflage it ñ lose it in the underwater jungle noises, so to speak." Bud scratched his head. "How do we do that?" "By amplifying the natural undersea sounds all about it," Tom explained. "Fish and all forms of underwater life make a background noise over the hydrophones, you know." As Bud nodded, Tom went on, "So we simply step up the volume till the subís own noise gets drowned out or ëwastedí in all the racket." This could be done, he concluded, with fairly simple amplifying equipment. Bud, Hank, and Arv were jubilant at the idea. Would the anti-detection jetmarine work? Most modern military submarines use anti-detection technologies, the details of which are closely held military secrets. In order to evade sonar, submarines now have a special sonar absorbing coating. This is a passive defense, in contrast to Tomís idea that uses active elements. The coatings prevent a reflection of the sonar impulse, which effectively hides the submarine. This is similar in concept to the B2 stealth bomber, which is designed in such a way to minimize the radar reflections. I think that Tomís idea of using transducers has some merit. My only reservation is that the plastic coating (unless it absorbs sonar impulses) may reflect back some of the sonar. Also the transducers themselves may not absorb the impulses. Presumably Tomasite absorbs or scatters enough of the impulses to avoid detection. Some time ago on a science program I saw some work being undertaken for the US Army to reduce the visibility of soldiers that uses a similar active approach (but with light rather than sound). The soldier would wear a suit that is made of closely spaced light emitters and detectors. The emitters at the front of the suit would display the image that the detectors picked up from behind the suit and vice-versa. This makes it very difficult to actually see the soldier. Tomís idea of amplifying natural undersea sounds is also very interesting. The idea is to reduce the signal to noise ratio by increasing the amount of background noise. I am not aware of this technology being used on submarines. It might be possible to detect the presence of a submarine using this technology by an increase in background noise. Normally, submarines use the opposite approach of reducing propulsion noise by using quieter propeller designs and other techniques to reduce the submarine noise below the background noise of the ocean. By way of analogy, the stealth bomber uses special exhausts to reduce the infrared signature of its engines so that they canít be detected above ambient "noise". The overall effect is to reduce the signal to noise ratio which is the same idea as in the book, but achieved in a different manner. In summary, I believe both approaches are probably feasible, even if they are not being used in the way described in the book. What impact would the anti-detection jetmarine have on our lives? Modern submarines do use sonar-absorbing coatings and are designed for low noise, so technologies with a similar effect to those described in the book are now in use. This invention counters the Brungarian submarine stealth technology. Tom explained that the new system he had in mind would send out a complex pulse ñ that is an underwater sound wave with many harmonics instead of a single tone, sharp peaked sound impulse. "This will make it less likely that their anti-detection gear will absorb all of it," Tom went on. "Whatís not absorbed will return as an echo. Iím also going to modify our receivers. But Iíve still not worked that out." Bud nodded, his forehead puckered in a look of concentration. "So-?" "So our sonar picks up all that hash, and by means of a computer setup filters out the subís real echo from the shadow reflections." The book describes a "correlation calculator" that is used to determine how close the returning pulse is to the original pulse and displays blurred echoes or shadow echoes in red on the screen. This would be an indication that a stealth submarine was detected because it would absorb a range of frequencies and reflect some others. This explains the name "quality analyser sonar" since it measures the quality of the returned sonar pulses to determine the presence of an enemy submarine. Would the quality analyser sonar work? The quality analyser sonar would work if the Brungarian submarine would absorb only certain frequencies. This would be likely if an "active" stealth approach is used. If a passive sonar absorbing coating was used, it is likely that this would be able to absorb a large frequency range. The book preempts the computer systems now in use to automatically analyse sonar data. Advanced technologies such as neural networks are now being used. Perhaps Tom uses a simple form of neural network in his "correlation calculator" since it is described as a computer filter. What impact would the quality analyser sonar have on our lives? Technologies similar in principle to the quality analyser sonar, but far more advanced, are in widespread use in the submarines throughout the world. I attended an artificial intelligence conference in 1995 and there was a large contingent of scientists who presented papers on similar systems that they were developing for a submarine fleet. Looks like Tom Swift knew what he was doing after all!